- Shipped frozen in 6-packs! We never cut corners when it comes to baking Decadence Gourmet 'Cheesecakes in a Jar®.' We use only quality ingredients, including Philadelphia Cream Cheese®, whole eggs, unsalted butter, pure cane sugar and real cream. And, our Home-Made Biscotti Crumb Crusts perfectly complement the Rich Cheesecake Fillings and Gourmet Toppings. Each order of delicious 'Decadence Gourmet Cheesecakes in a Jar®' is shrink-wrapped and packed frozen in custom cardboard holders (you can choose to ship in our custom-made mini-wooden crates as a gift box option) , then packed in a thermal cooler with composite, reusable gel packs, and shipped via FedEx right to your door. Just thaw and eat! 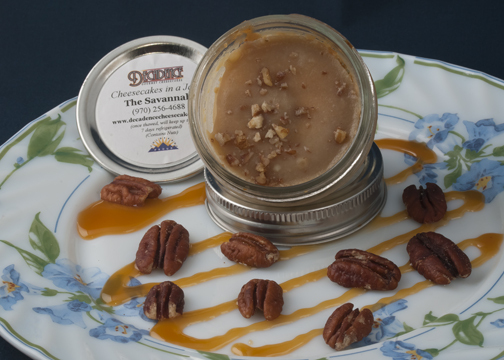 Read our FAQs Page for more information about Decadence Gourmet Cheesecakes in a Jar®. 'Occasionally, but very infrequently, we do sell out of a flavor for a short time. We reserve the right to substitute another flavor. We will substitute the closest flavor to the 'sold-out' flavor.